Fix macOS crash, improved functionality like speedwalk(), getRoomHashByID() and for internationalisation. 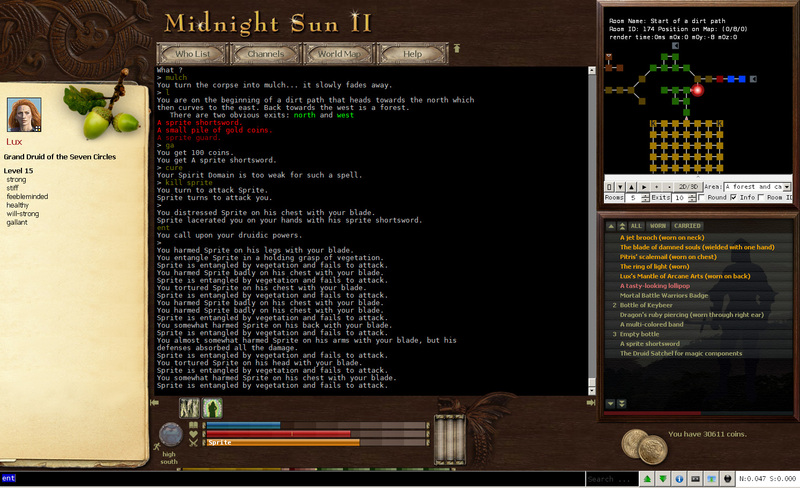 It’s a game client that you can play multiplayer, pure-text RPGs with – called MUDs, precursors to today’s MMORPGs. There are thousands of unique worlds online – download Mudlet for free on Windows/macOS/Linux, join one and enjoy! In some cases the newly-introduced autocompletion feature had a chance to crash Mudlet for Mac users – dicene fixed this up! Thanks also to the Mudlet community for the detailed reports and quick tests especially in Mudlet Discord. StickMUD is now supported by Mudlet for automatic map downloads! Hit the map button and if you don’t have any map loaded, Mudlet will offer to download it for you. The technology behind this is called MMP, if you’d like to add something similar to your game. Credits to Tamarindo for adding support for this in StickMUD and to vadi2 for the support in Mudlet. Autosave will no longer save and run a script as soon as the mouse leaves the editor window. It will now automatically save your recent changes every minute. Thanks vadi2! Jor’Mox gave speedwalk() some love. It’s a handy function in case you want to make an alias to just walk a set amount of directions (e.g. speedwalk("2ne,3e,2n,e")). You can now hide the sent directions from being shown. The function will now also understand the long form of directions such as “down”, “northeast”, and so on. This can be especially handy when you want to use results from getPath() for example. hallor added this function which will get a room’s hash when given its room ID. Handy in case your game has hashes and you want to share metadata without giving away your map! As we continue striving to make Mudlet 4.0 friendly for players of all languages, Kebap has improved some of the text shown to users to make them easier to translate. After another improvement by vadi2, the getRooms() function will work with international text as well. demonnic, dicene, hallor, JorMox, Kebap, keneanung, SlySven, and vadi2.